Driving Directions: Travel on Nguyen Van Troi Street, adjoining with Nam Ky Khoi Nghia Street, turn right to Nguyen Thi Minh Khai Street. Go straight and turn left to Cach Mang Thang Tam Street, follow the roundabout. 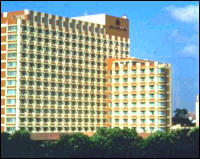 The New World Hotel Saigon is on your right side.